"How did dinosaurs live, and how are they found by humans millions of years later? Every dinosaur bone has a story to tell and palaeontologists know just how to read them." How did dinosaurs live, and how are they found by humans millions of years later? Every dinosaur bone has a story to tell and palaeontologists know just how to read them. Learn how dinosaur experts dig for prehistoric creatures and marvel at what they unearth. 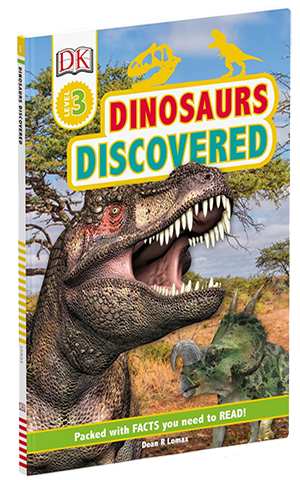 "Dinosaurs of the British Isles is easily the single best reference on British dinosaurs that has ever been produced. This book was clearly an enormous amount of work". *Dr Steve Brusatte, The University of Edinburgh. From the back cover: If you were asked to name a dinosaur, the chances are you would give a foreign example, such as Tyrannosaurus rex, despite the term dinosaur’ having been conceived by a British palaeontologist for fossils found in England. In fact, the British Isles have their own tyrannosaurs! The very first descriptions of dinosaurs in the early-mid 1800s were all based upon remains discovered in England. Since their initial discovery, dinosaur fossils have been documented at numerous locations across the British Isles, in England, Wales, Scotland and Northern Ireland. Indeed, the Isle of Wight is often referred to as the dinosaur capital of Europe. British dinosaur diversity is rather high, with theropods, sauropods, ornithopods and thyreophorans (stegosaurs and ankylosaurs) all represented. Remains found across the British Isles represent fragments to complete individuals, comprising unique examples. 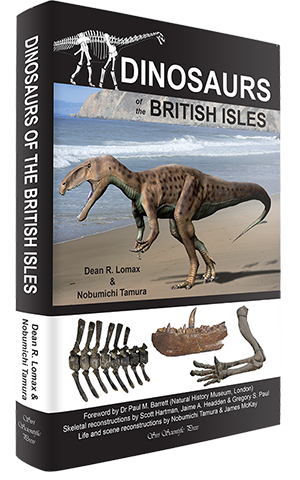 Following a foreword by the leading British dinosaur scientist Dr Paul Barrett (Natural History Museum, London), the authors summarise what is known about the history of every dinosaur species discovered within the British Isles. They include photographs of hundreds of fossils, many of which are usually hidden from view behind the scenes in various museum collections. These are supplemented by scientifically accurate skeletal reconstructions and vivid life reconstructions of how some of the animals most probably appeared when alive. This book is truly unique, providing the first comprehensive account on the dinosaurs of the entire British Isles. It will be of interest to a broad audience, from academics to those with a general interest in fossils. It will no doubt form, in part, the early inspiration for some readers to consider palaeontology as a future career. Personal touch: Like most children, growing up, I had an interest in dinosaurs, yet I wanted to learn about the dinosaurs found where I lived. All of the books I read, or programmes I watched, discussed dinosaurs from across the globe. Little to no comments regarding dinosaurs from the British Isles were mentioned. To some extent, this is where my desire to write the book originally spans from. In 2009, co-author and good friend, Dr Nobumichi Tamura (palaeoartist and physicist), and I created the website palaeocritti.com. We discussed the possibility of collaborating on a few books, and first began working on this Cetiosaurus-sized project in early 2011. Interestingly, despite the word dinosaur being named in Britain around 1841-2, by Sir Richard Owen, a book compiling the dinosaurs found here has never been done before, although attempts had been made. Thus, it is the very first book dedicated to British dinosaurs. It is my hope that it will inspire a new generation of palaeontologists. 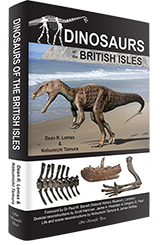 From readers curious to uncover what dinosaurs have been found where they live, to those interested in learning about the 100+ (historic) species found in the British Isles, the book will no doubt appeal to anybody who likes dinosaurs. It is a must-have book for academics, especially those who require specific details of dinosaurs (e.g. individual bones, stratigraphic data, photos, numbers etc). It was fantastic to have so many individuals and organisations involved with the creation of this book. I especially wish to thank my co-author, Nobumichi Tamura. "This is beautifully illustrated and well researched, with more than 200 glossy photographs and always interesting comments on the subject matters it touches upon. In short, it is a delight". *Jon Trevelyan (Deposits Magazine, 2011). From the back cover: The small coastal town of Whitby is located in North Yorkshire, England. It has been associated with fossils for hundreds of years. From the common ammonites to the spectacular marine reptiles, a variety of fossils is waiting to be discovered. 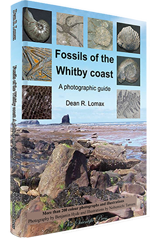 This book will help you to identify, understand and learn about the fossils encountered while fossil hunting along this stretch of coastline, bringing prehistoric Whitby back to life. It is illustrated in colour throughout with many photographs of fossil specimens held in museum and private collections, in addition to detailed reconstructions of what some of the extinct organisms may have looked like in life. As well as the more common species, there are also sections on remarkable finds, such as giant plesiosaurs, marine crocodiles and even pterosaurs. The book provides information on access to the sites, how to identify true fossils from pseudo fossils and even explains the best way of extracting and preparing fossils that may be encountered. This guide will be of use to both the experienced fossil collector and the absolute beginner. Take a step back in time at Whitby and see what animals once thrived here during the Jurassic Period. Photography by Benjamin Hyde and illustrations by Nobumichi Tamura. Personal touch: As a Yorkshire lad, I often visited the coast. Whether this was to see the beach, or eat fish and chips, I’d always be excited at the prospect of finding or seeing fossils on the beach and in shops. My favourite location was Whitby whereby I collected and purchased fossils, many of which formed parts of my childhood fossil collection. One thing that frustrated me was the severe lack of readily available identification guides. Despite arguably representing some of the best Early Jurassic fossils in the country (in fact, the world), a book on the fossils from the Whitby coast had ceased to exist. During 2009, as my career had begun unfolding and my confidence in my abilities increased, I began to look at the prospect of creating a book on the fossils found along the Whitby coast. Born here, the idea of an identification guide to assist and help those of all ages. It was a pleasure working with Benjamin Hyde (for photography) and Dr Nobumichi Tamura (for life reconstructions). The book has since been hailed a 'saviour' for fossil hunters. Would you like a personalised copy? If you would like a signed copy, or a handwritten dedication message, please enter the details in the given field. To avoid disappointment please ensure correct spelling and content. The book shall be posted asap. Please enter dedication request HERE.